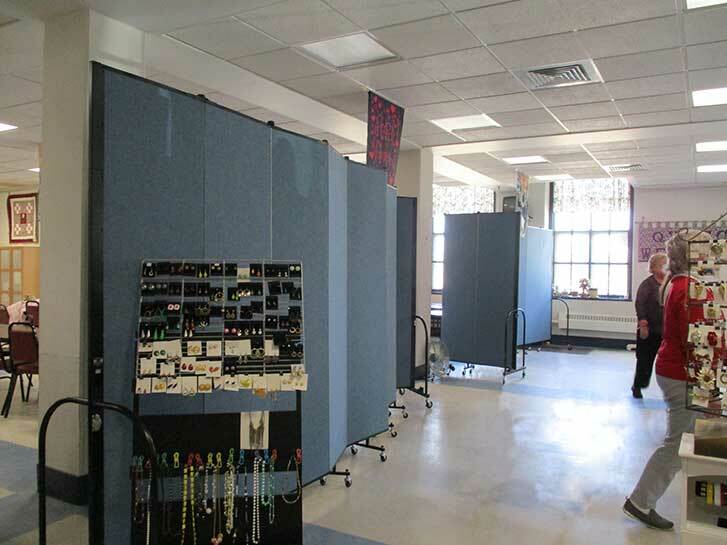 Uses: Assisted Living Colors: Blue Lengths: 9 panel 16'-9" Heights: 7'-4"
The Quinebaug Valley Senior Center use their Screenflex Room Dividers to separate the activity room for the various events that the seniors enjoy. As seen here, the assisted living center uses two room partitions to divide an open space to allow residents to use one area of the room for games and family visits while the other side of the room is used a craft fair. This is a great way to maximize the use of their facility space and offer more activities to their residents and guests. “Thank you for your excellent service,” adds Quinebaug Valley Senior Center director.